Bully Pulpit Interactive, a Washington, D.C. based consulting firm founded by former Obama campaign official Andrew Bleeker, provided more than $800,000 in online advertising services to Highway 31, an independent expenditure committee based in Birmingham, Alabama, in the 17 days between November 6, when the Alabama group filed its statement of organization with the FEC, and November 22, the ending date for the first statement of activities it filed with the FEC. Reports filed with the FEC by Highway 31 indicate that it has no cash on hand, and has not paid a single penny to either Bully Pulpit Interactive or Waterfront Strategies. Highway 31’s report shows that it currently owes Bully Pulpit Interactive the full $800,000 it has advanced, and owes Waterfront Strategies the full $309,000 it has advanced. The unusual and secret arrangement between vendors Bully Pulpit Interactive and Waterfront Strategies and Highway 31, which appears to be little more than a shell legal organization used as a “cut-out,” raises significant ethical questions. Were Bully Pulpit Interactive and GMMB Consulting (through its subsidiary Waterfront Strategies) simply attempting to mask donations from Washington, D.C. based liberals to the Jones campaign, in effect? Is the entire arrangement simply a sophisticated ruse to hide the true origins of the more than $1 million that has been poured into Alabama to support the Jones campaign through what appears to be nothing but a shell organization? A legal expert on federal election law tells Breitbart News this arrangement is probably “a legal in-kind contribution to the IE” by Bully Pulpit Interactive, according to a recent FEC administrative ruling, even if Bully Pulpit Interactive is never paid a dime by Highway 31, the IE. However, the arrangement may violate the spirit of federal election law if some other group is paying Bully Pulpit Interactive a like amount for an “unrelated project” that requires basically no work. Proving that such a behind-the-scenes arrangement was, in effect, made to compensate, however, would be very difficult, the expert says, even it does exist. “Yes, this appears to be legal. FEC regulations concerning debt are fairly straightforward: political committees are allowed to have debt as long as they report the amount of debt to the FEC. The regulations do not address the situation of taking on debt when a committee has no assets or donors, ” Tyler Cole, Legislative Director & Policy Counsel at Issue One, a non-profit whose “goal is to pass and protect federal legislation that strengthens accountability and returns America to a system of self-governance for the common good,” told Breitbart News when asked about the propriety of the Highway 31 arrangement with Bully Pulpit Interactive and GMMB Consulting’s Waterfront Strategies. “Issue One believes that it is important for voters to know who is funding advertisements that seek to influence their vote,” Cole added. “This is disclosure in name only given that due to the reporting deadlines, voters will not be able to see what individuals or organization are funding Highway 31 until after the election. Unfortunate situations like these are why we believe that disclosure laws should be strengthened so voters get more information and get that information more quickly and easily,” Cole concluded. Breitbart News asked Bully Pulpit Interactive to confirm FEC records that show Highway 31 owes the company $800,000 for the provision of online advertising services between November 6 and November 22, but has received no response. Breitbart News also asked Bully Pulpit Interactive to explain how the company’s provision of this $800,000 in advertising services to an independent expenditure committee supporting the Doug Jones campaign without any payment, or any reasonable expectation of ever receiving any payment from the independent expenditure committee, is not an illegal in-kind campaign contribution to the Doug Jones campaign. Bully Pulpit Interactive did not respond to either question. In addition, Breitbart News asked GMMB Consulting to confirm FEC records that show Highway 31 owes the company ‘s subsidiary, Waterfront Strategies, $309,000 for the provision of media buy services between November 6 and November 22, but has received no response. Breitbart News also asked GMMB Consulting to explain how its subsdiary’s provision of this $309,000 in media buy services to an independent expenditure committee supporting the Doug Jones campaign without any payment, or any reasonable expectation of ever receiving any payment from the independent expenditure committee, is not an illegal in-kind campaign contribution to the Doug Jones campaign. “We are fully compliant, and we don’t discuss client information,” Waterfront Strategies told Breitbart News in an emailed statement provided by GMMB Consulting late Friday. This is not the first time that the behind-the-scenes activities of Waterfront Strategies have come into question. Waterfront, it turns out, is an internal branch of GMMB. It was incorporated in Delaware, and its president is listed as Raelynn Olson. She is GMMB’s managing partner. Waterfront Strategies, they explained, exists so that GMMB has a separate corporate entity where it can employ people to handle outside expenditures — in this case mostly from the House Majority PAC that aims to retake control of the House from Republicans, and the Majority PAC that is trying to preserve Democratic control of the Senate. The arrangement keeps the money legally separate from people who may be working more directly with Senate or House candidates. Thus campaign laws barring coordination are not violated. That’s an awfully thin fig leaf, critics charge. “It’s the Kabuki that’s done to conform with the form while putting the lie to reality,” Meredith McGehee, now a strategic advisor with the Campaign Legal Center, told the Post in 2012. Edward Still is listed as the Treasurer of Highway 31 in documents filed with the FEC. Still, a far left activist attorney based in Birmingham was Director of the Voting Rights Project of the Lawyers’ Committee for Civil Rights Under Law, a non-profit public interest law firm in Washington, D.C. from 1997 until 2001, according to his law firm’s website. In 2014, Still and a co-counsel “filed a new suit against the provision of Alabama’s campaign finance law forbidding PAC-to-PAC transfers. The law basically prohibits any transfer between political actors except personal contributions to any group, PAC contributions to principal campaign committees, and limited payments from principal campaign committees to political parties,” according to his law firm’s website. The case was THE ALABAMA DEMOCRATIC CONFERENCE, an Alabama political action committee, et al., Plaintiffs, v. LUTHER STRANGE in his official capacity as the Attorney General of Alabama; et al., Defendants. “Our organizational client uses its funds to run GOTV drives,” Still notes. Breitbart News left a message for Still on his law firm’s voice mail system on Friday, asking him to explain why the arrangement between Highway 31 and vendors Bully Pulpit Interactive and Waterfront Strategies is legal under federal election law, but has not received a response. “Bully Pulpit Interactive was founded by the digital marketers of the Obama Presidential campaign to help clients in the public and private sectors create modern versions of what President Roosevelt once called a ‘bully pulpit,’ or a platform, to tell their story, increase their bottom line and shape public opinion,” according to its website. 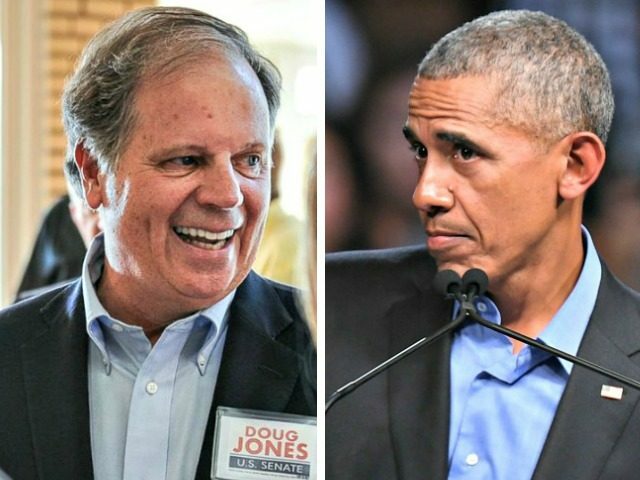 According to another report filed with the FEC on November 30, these two firms combined to extend an additional $700,000 in credit to Highway 31 to support the Doug Jones campaign in the seven days between November 23 and November 29, bringing the total amount of credit extended by the firms to Highway 31 more than $1.8 million in just 24 days. The special election for the U.S. Senate in Alabama between conservative Republican Roy Moore and liberal Democrat Doug Jones is scheduled to be held in 11 days on December 12. “As it has been widely reported, Highway 31 continues to follow every appropriate rule and regulation. The end of the reporting period was in the middle of the PACs startup. The PAC will file contributors per the FEC reporting schedule,” a spokesperson for Highway 31 told Breitbart News in an emailed statement shortly after the publication of this story.